Well it’s been a while but I thought I had better come back and catch up. I would like to share these cards we are making for this week’s workshops. The title is “Vellum & Velvet” – two of my favourite papers to use but sometimes a little tricky to work with. 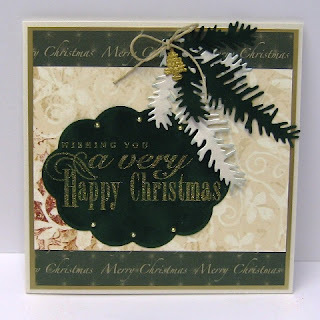 I absolutely love velvet paper, it is so lush and strokable. It has a plush velvety texture and the colours are really rich. 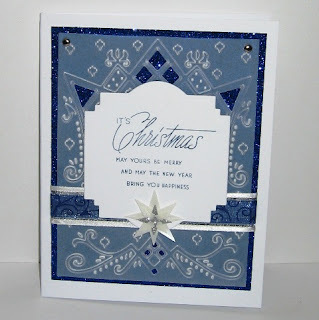 It embosses beautifully with folders and can also be stamped and heat embossed. It die cuts really easily as well. Be aware though – all velvet papers are not the same, I like SEI’s paper. Similarly, vellum can be embossed with folders but you have to treat it gently and stretch it gradually or it can split. Again, heat embossing works really well too. The text on this card has been embossed in a sparkly gold powder and the velvet paper has been die cut using a nestie. Here’s a close up of the velvet panel . This next sample is really simple – a panel of lovely holly paper sets the background and a wrap of vellum with punched borders and the text embossed in Winter Wonderland powder which is white with a slight sparkle. Here I have used one of the Marianne Designables. If you’ve never played with these, it’s well worth doing. They part cut the design and emboss the rest – really fab. 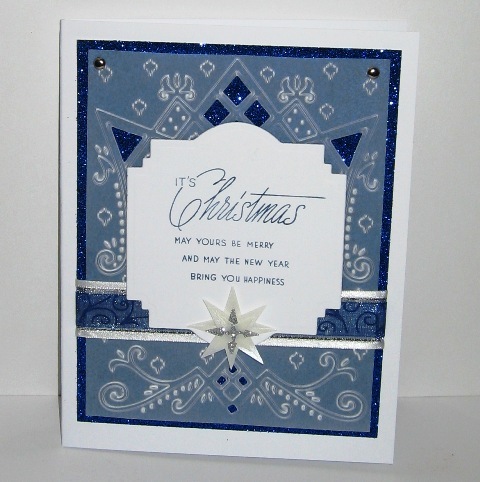 I’ve used a white vellum for the panel and set it against a strong blue glitter card. 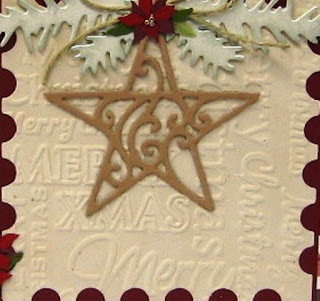 The vellum mutes the card it covers but the glittery bits show through the cut out areas and around the border – I like this effect. 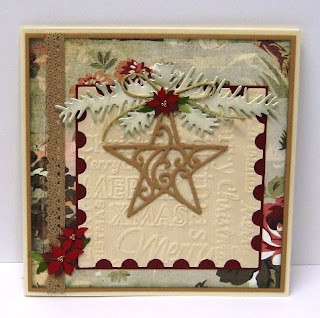 Another nestie panel with a stamped message and some gorgeous ribbon completes the design. This next sample shoes just how well the velvet paper embosses with a folder. 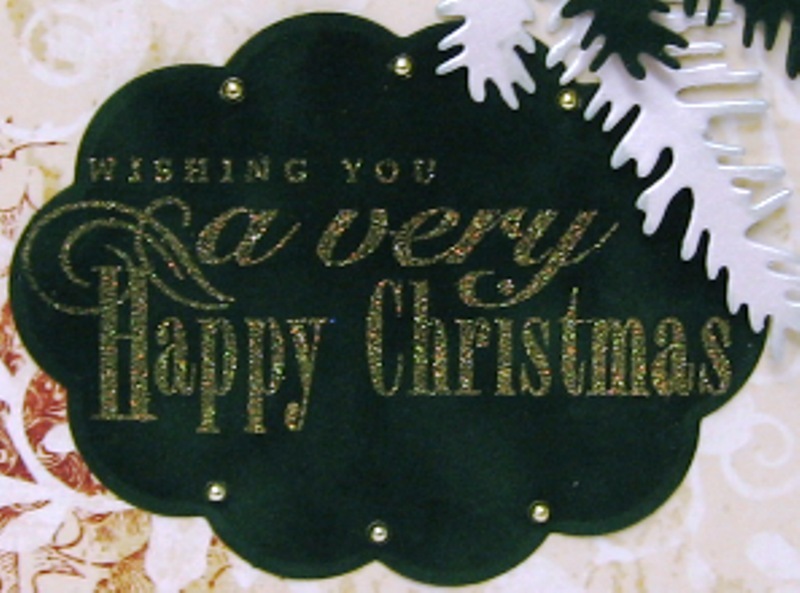 The central beige velvet panel has been embossed with a Christmas text folder and the detail is taken on very deeply. It has been die cut with the postage stamp nestie and mounted against a deep red card. 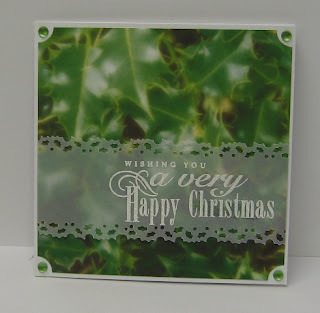 Marianne die cuts, Basic Grey Wassail paper, lace and some poinsettias finish the card off. The tiny but detailed poinsettias are from Artoz and we love these products in the shop, the quality is amazing.